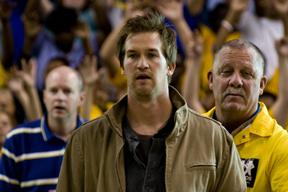 A high school basketball star is pressured by criminals to throw the big game. Synopsis - High school journalist Gar covers the basketball team as it heads toward a state championship. When his best friend Matt, the team's star, is asked by a drug dealer to throw the big game, Gar gets caught in the middle. This appealing, heady independent film won audience fans here at the Chicago International Film Festival. 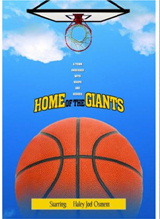 Starring Ryan Merriman as Matt, a high-school basketball star, and Haley Joel Osment as Gar, his loyal, brainy sidekick, "Home of the Giants" is funny and gritty. With sly digs at high-school culture, filmmaker Rusty Gorman spins a sharp morality story centered on the tribal insanity of Indiana high-school basketball. "Giants" is smartly shot with just the right character rotation between its two leads: As the sharp-shooting star, Merriman struts with high-school star cockiness and self-absorption, while Osment is winning as the sidekick who must assume leadership. Other players deliver solid turns: Kenneth Mitchell is riveting as Matt's bad-apple brother. Danielle Panabaker's new-girl-in-school freshness adds a perky dimension to the storyline. Writer-director Gorman shows a talent for credible character creations and a deft control of the story, no mean feat since "Giants" blends multiple narrative styles of drama, romance and comedy.Technical contributions are A-game, most prominently editor Dan Schalk's up-tempo pacing and cinematographer Rodney Taylor's on-target framings of the heartland. "We just saw this at a standing-room-only showing at the Heartland Film Festival (in Indy) ... and this is a wonderful film! It deserves a big release, because THIS one has something that will grab the emotions of audiences across America! It's so much more than anything easily labeled as one "genre" or another -- more than a "coming of age" film with rich and believable highschool characters (where the kids are real people with real problems, not just another group of MTV-inspired cardboard cliches) -- this excellent movie packs in a great mix of suspense, crime thrills, basketball "sports" excitement AND family heartache and romance! The writing is crisp and lean, a fine blend of angst and suspense and humour; the acting is rich and totally enwraps you with these characters' trials & tribulations, their joys and fears and triumphs and losses as human beings. 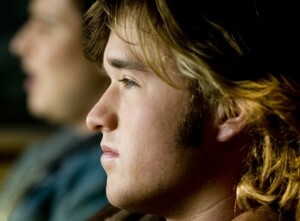 The three leads are wonderful, Ms. Danielle Panabaker is beautiful and grabs the eye, Ryan Merriman is excellent as the highschool sports star trapped between being a hero and a loser, and Haley Joel Osment gives a deep performance as the kid growing beyond the shadow of his hero to become the bigger hero -- a boy awaking to be a bigger man true to himself. Don't miss seeing this movie -- you'll love it!" "Home of the Giants is skillful, believable and genuinely suspenseful. A movie that consistently offers up surprises. When the story goes into thriller mode it actually works because these are well-drawn characters instead of just plot devices." Writer-director: Rusty Gorman was director of photograph on Zombie High and Associate Producer of Miracle Beach. Actors: Hayley Joel Osment (Oscar nomination for The Sixth Sense; 25 awards and 28 other noms for that film and such works as Artificial Intelligence:AI, Pay it Forward and Forrest Gump; his 72 other credits include Secondhand Lions, Murphy Brown and Silicon Valley), Danielle Panabaker ( 3 wins and 3 noms for works including Time Lapse, Empire Falls and The Guardian; her 47 other credits include Friday the 13th, Sky High and Justified), Ryan Merriman (6 wins and 8 noms for such works as The Pretender, Deep End of the Ocean and Taken; his 52 other credits include 42, Pretty Little Liars and The Ring Two and Kenneth Mitchell (52 credits include Jericho, The Astronaut Wives Club and Miracle). Executive Producers: Damon Martin (his other 13 credits include Night of the Demons, Shooting Gallery and Northfork) and Elizabeth G. B. Gregory Harrison both produced National Lampoon;s Pucked. Producers: William R. Greenblatt (Won WorldFestHouston Jury award for Nightbreaker and 4 noms for that film and a CBS Schoolbreak Special; his 13 other producer credits include Da, Judgment in Berlin and Doomsday Man), Dan Schalk (produced Journey of Redemption and edited 25 projects, including 19 episodes of Parks and Recreation), L. Charles Grimes (produced Pucked) and Eugene Osment. Associate Producers: Walter Josten (won Emmy for The Incredible Mrs, Ritchie; his 63 other producer credits include The Groomsmen, The Flock, Survival Island, Holes and Around the World in 80 Days), Pascal Borno has 14 other producer credits such as Taxman, The Phenom and Acts of Betrayal), Jack Freeman III (wrote and directed Aberration), Michael Huxley (wrote Pork Fist Punch! ), Jeff Geoffray (exec produced Spinning Man, Under the Silver Lake and LAbyrinth), Scott Karol (produced 20 other projects such as The Comedian, Cake and The Yellow Birds) and William Witiak. Composer: Mike Suby won 4 awards for The Vampire Diaries and Make it or Break it; his other 36 composer credits include Pretty Little Liars, The Butterfly Effect and Robot Chicken. Cinematography: Rodney Taylor won Emerging Cinematographer award for Grind and an Emmy nom for Ballers; his 34 other credits include That Evening Sun, She’s Out of My League and 12 episodes of Getting On.